Westernport Water has provided the community with a convenient way to fill up their water bottles, launching three custom drinking stations in San Remo and Cowes. The drinking stations have a fountain for use as well as refill points that allow visitors to easily top up their water bottles free of charge. Two stations feature a dog bowl built into the base of the fountain, giving pet owners the ability to give their thirsty canine companions a drink while out walking. 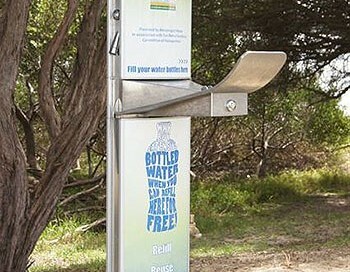 One drinking station has been installed at Erehwon Point in Cowes while the other two are located in the San Remo Lions Park and San Remo Foreshore area. According to Murray Jackson, Westernport Water’s Managing Director, the drinking stations are a great addition to some of our most popular attractions. “Additionally, by drawing water directly from the local drinking supply, people can reduce the negative effect that they may have on the environment from purchasing bottled water,” he said. Thanks to Bass Coast Shire Council and San Remo Foreshore Committee for their contribution and support to make this possible. As part of the City of Mandurah’s commitment to promoting a healthy and active lifestyle, a filtered water drink station has been installed in the popular boardwalk area. The aquafil water fountain, installed near the Mandurah Visitor Centre in February, has already been used by hundreds of locals and visitors during the Channel Seven Mandurah Crab Fest weekend last month. The public drink station features wheelchair accessibility and is in a well-lit and shaded area, and is also close to the Transperth Mandurah Shuttle bus stop. The aquafil also has a built-in dog bowl so people walking their dogs in the area can give their pets a drink. Cyclists do not even have to get off their bikes to use the aquafil, as the fountains are all at the right height. The aquafil machine was funded by the City of Mandurah through the Federal Government’s Healthy Communities Initiative, and promotes recycling and reduced wastage of plastic bottles. Passersby are encouraged to use the fresh, filtered drinking water to refill their water bottles and increase their water intake throughout the day. Ann-Marie Gladwell and her dogs Cassie and Lucy took advantage of the dog bowl while taking a walk through the area. THE last drinks bell has rung in Canberra’s public schools with the government moving to ban sugary drinks by the end of the year. Vending machines will be emptied of soft drinks, fruit juices and full-fat flavoured milks by the end of first term and canteens will have to phase them out by the end of 2014. They’ll be replaced with water refill stations and reusable drink bottles. Parents will be encouraged to send healthy drinks packed in their children’s lunch boxes. However the ban won’t extend to drinks sold at fetes and fundraisers. It’s all in the interests of tackling the ACT’s growing obesity problem. “We must not allow the next generation of children to grow up with the same bad eating and drinking habits that some adults are now paying the price for,” Chief Minister Katy Gallagher said in a statement on Friday. The fruit juice industry says the government’s decision to include its products in the ban is a misguided attempt to show leadership. “The ACT government is jumping at shadows and is concerned about the sugar in juice which is naturally occurring and comes from the originating piece of fruit,” Fruit Juice Australia chief executive Geoff Parker told AAP. He said a blanket ban sent the wrong message to children when evidence showed kids who drank juice had a better quality of diet overall. Ms Gallagher said canteens would follow the traffic light guidelines so juices that were 99 per cent fruit and sold in small quantities would be for sale occasionally, along with some cordials and flavoured mineral waters. She said it was expected for industry to push back against the decision.